Next week on May 8, Grateful Dead fans around the world will mark the 40th anniversary of one of the most revered and traded shows in the band’s extensive history, that of 5/8/77 at Barton Hall at Cornell University. The show is a thing of legend for fans new and old, an oft listened to show that features numerous stand out versions of classic Dead songs. It has led to Tompkins Country Legislature announcing May 8 as ‘Grateful Dead Day’ and will also feature the release of a book covering the lore of the show, Cornell ’77: The Music, The Myth And The Magnificence Of The Grateful Dead’s Show At Barton Hall. Listen to the show below and check out the numerous events taking place across New York State to honor this milestone anniversary in Grateful Dead history. Right in the town where the show was held, The State Theatre of Ithaca will hold…. The event at The State Theatre of Ithaca will feature a special set of acoustic Grateful Dead music performed by Ithaca’s own tribute band, “Terrapin Station”, an official listening party of the 1977 release on the State Theatre’s brand new state-of-the-art sound system, a unique silent auction and a variety of special guests and speakers. In addition to the live music and Grateful Dead celebrations, Cornell University Press and author Peter Conners will also be in attendance chatting to fans about their new book “Cornell 77: The Music, The Myth and The Magnificence of The Grateful Dead’s Concert at Barton Hall”. Signed copies will also be available for purchase at this event. 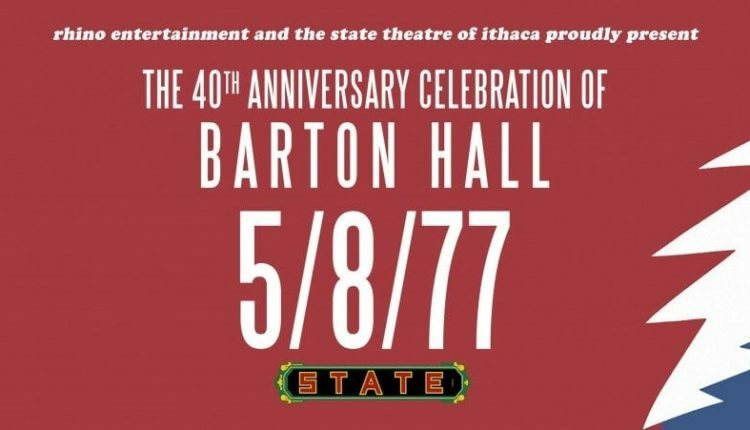 Central New York’s Dark Hollow will perform the 1977 Barton Hall show at Cornell on May 8 for the 40th-anniversary celebration at The Range in Ithaca. Dark Hollow is one of the premier Grateful Dead bands in the Upstate NY area and will be joined by Rick Redington & the Luv, who seamlessly introduce the best aspects of country and folk into a variety of genres. Part of the legacy of the Barton Hall performance is the quality of the recording that has circulated, and on May 8, The Capitol Theatre will host a listening party of the just-released “official” recording. The new recording will sound impeccably good through The Cap’s state-of-the art sound system and the new recording will be available for purchase at the event. Rhino Records will be on hand, giving away free stickers, patches, notebooks, and music releases as well. Also in attendance will be Larry Reichman, the “official” photographer of Cornell University on 5/8/77, who will be presenting never-before-seen images from this concert that we’ll be projecting on the walls of the Cap. He will also be promoting his upcoming book that will contain them. Tickets to this performance cost only $6.50 in advance – the original price of tickets for the Barton Hall performance in 1977.